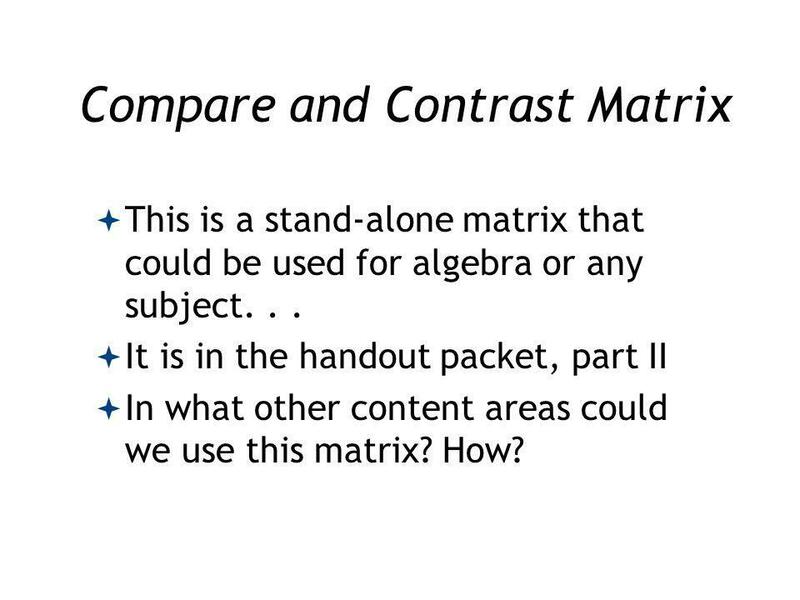 This is a stand-alone matrix that could be used for algebra or any subject. . . 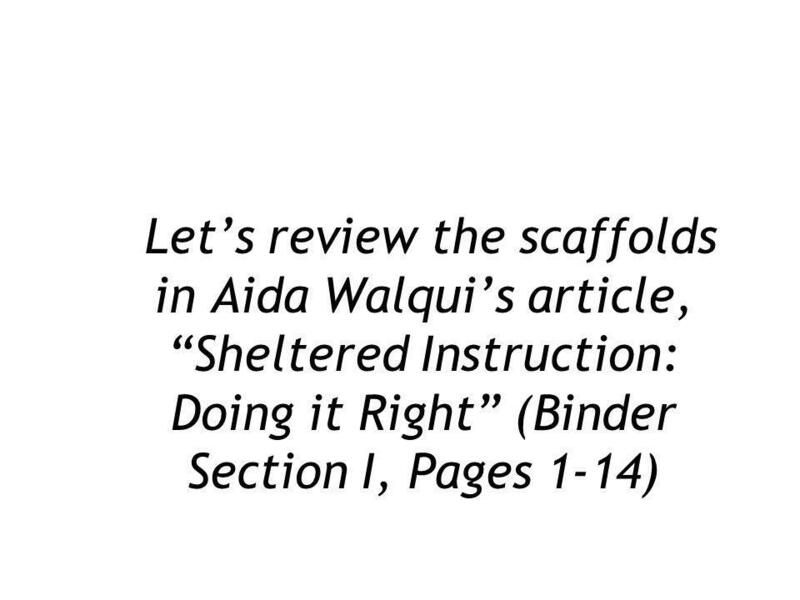 It is in the handout packet, part II In what other content areas could we use this matrix? How? 1. 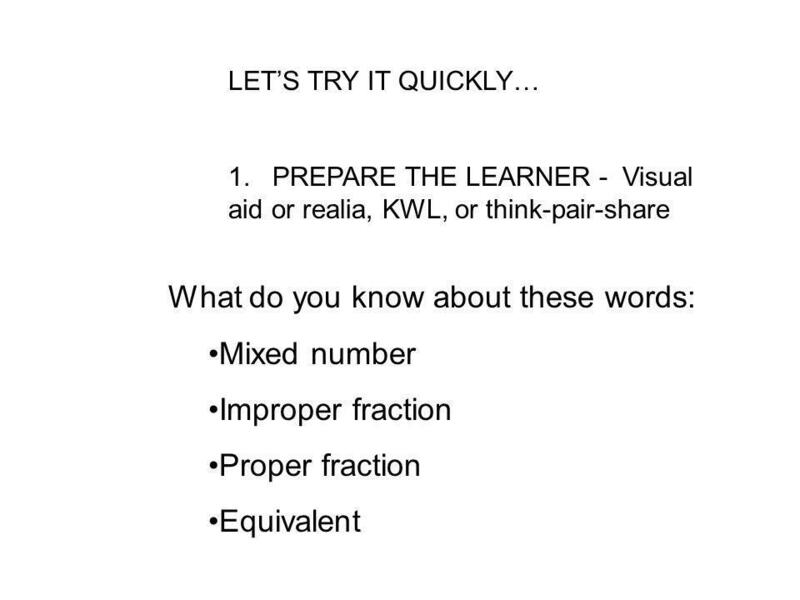 P - Visual aid/realia, KWL, then do a think-pair-share 2. 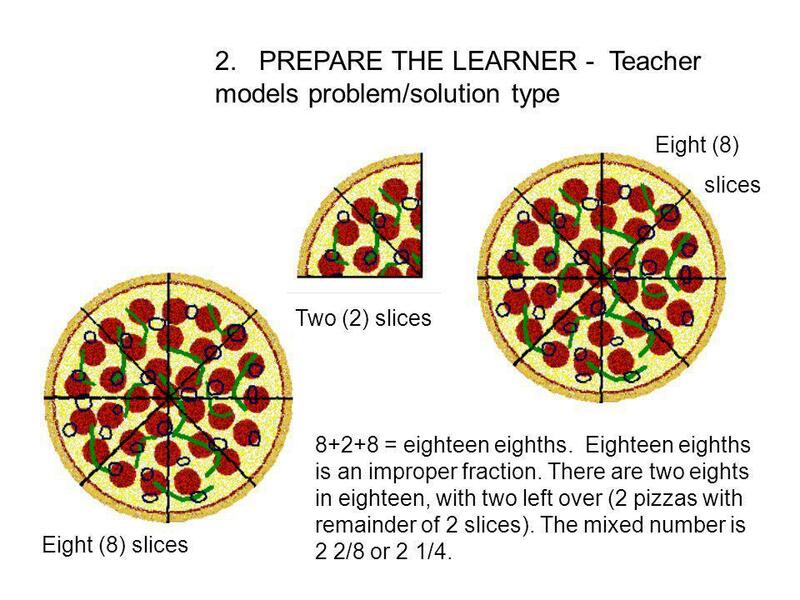 P - Teacher models problem/solution type 3. 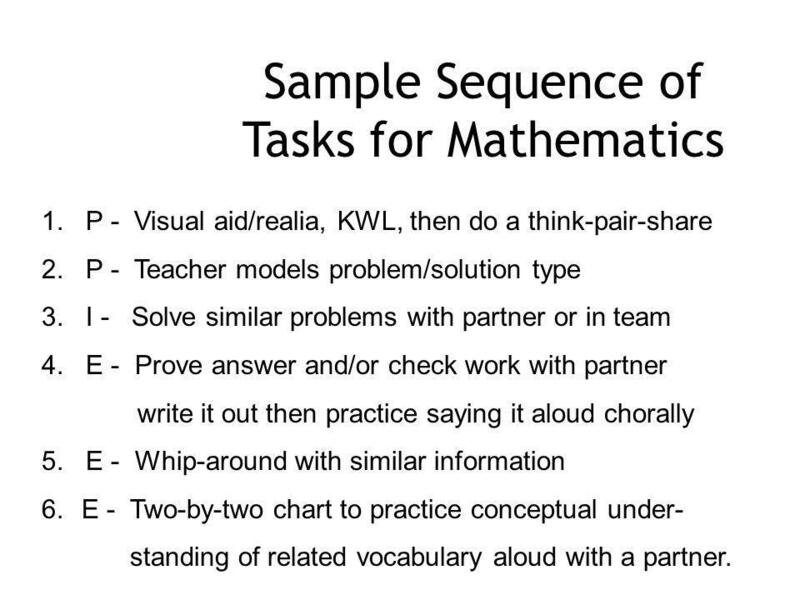 I - Solve similar problems with partner or in team 4. 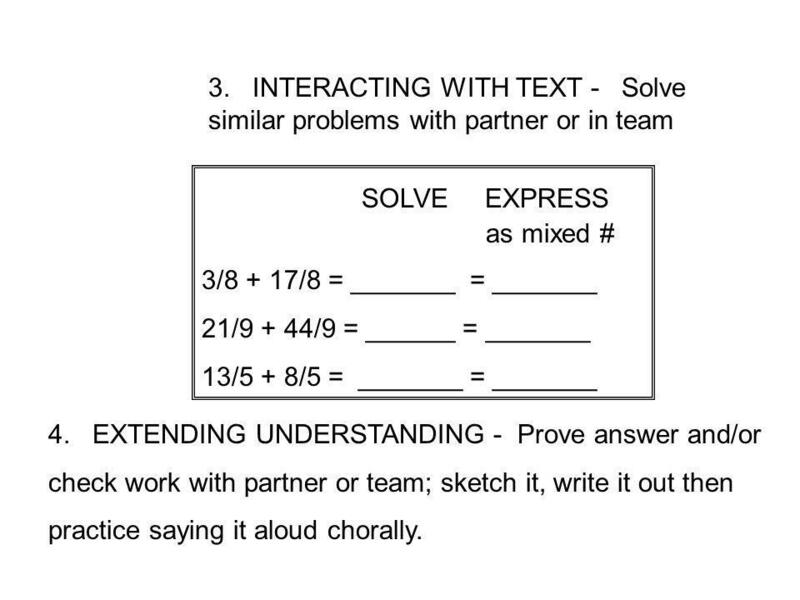 E - Prove answer and/or check work with partner write it out then practice saying it aloud chorally 5. 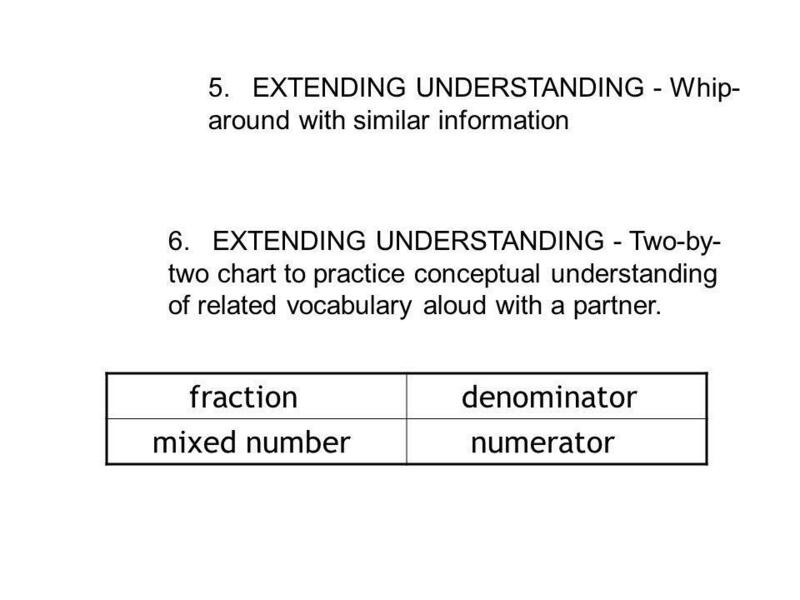 E - Whip-around with similar information E - Two-by-two chart to practice conceptual under- standing of related vocabulary aloud with a partner. SOLVE EXPRESS as mixed # 3/8 + 17/8 = _______ = _______ 21/9 + 44/9 = ______ = _______ 13/5 + 8/5 = _______ = _______ 4. EXTENDING UNDERSTANDING - Prove answer and/or check work with partner or team; sketch it, write it out then practice saying it aloud chorally. 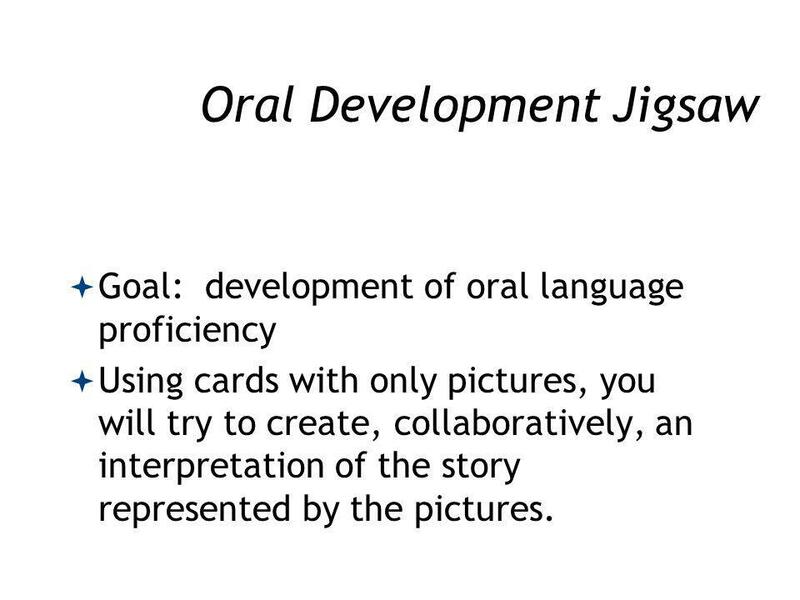 Goal: development of oral language proficiency Using cards with only pictures, you will try to create, collaboratively, an interpretation of the story represented by the pictures. 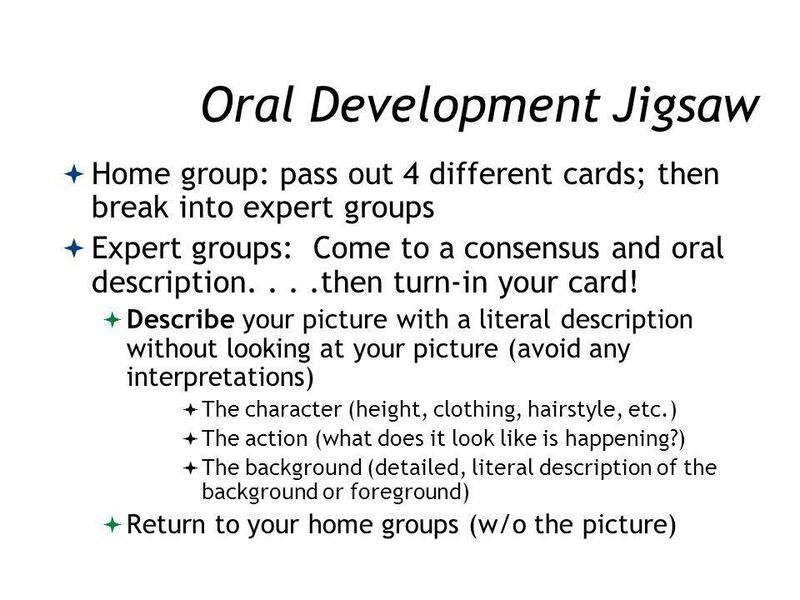 Experts: Report orally to your home group and decide on a sequence for the 4 pictures. 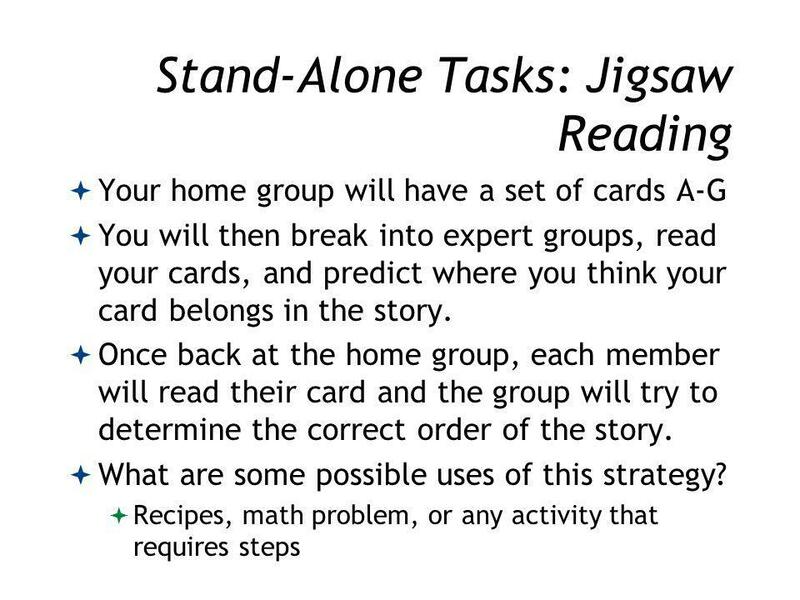 After the sequence is decided, create a two-paragraph (or so) narrative, adding rich detail as to the sequence of events. 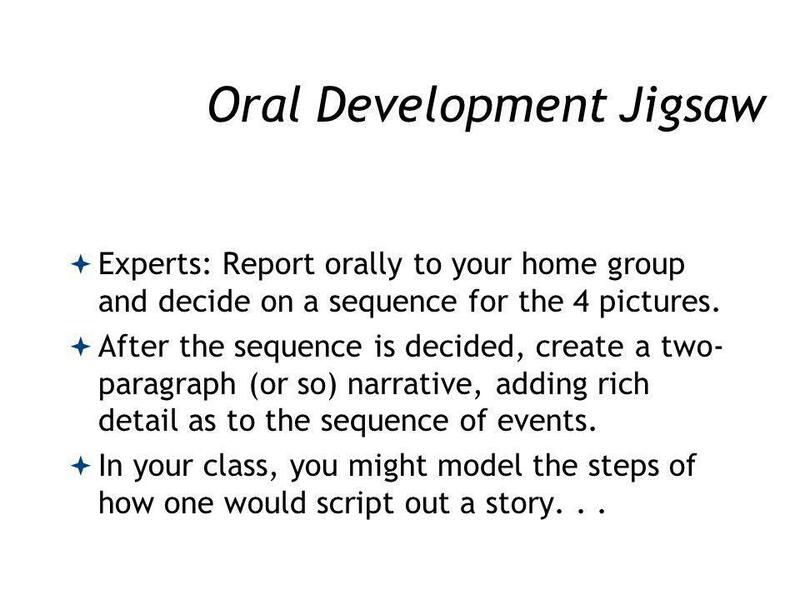 In your class, you might model the steps of how one would script out a story. . .
We will watch a short video clip without sound. Pay attention so you can describe what you see to a neighbor. 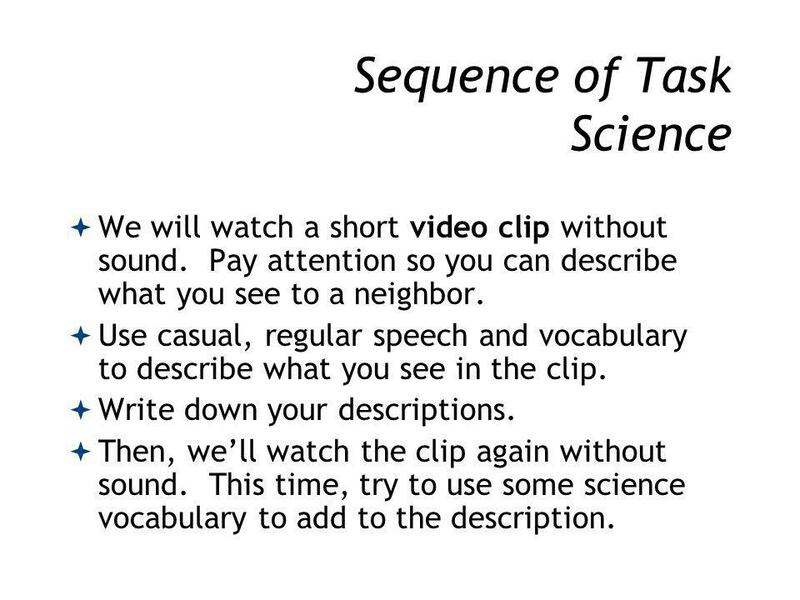 Use casual, regular speech and vocabulary to describe what you see in the clip. Write down your descriptions. Then, we’ll watch the clip again without sound. 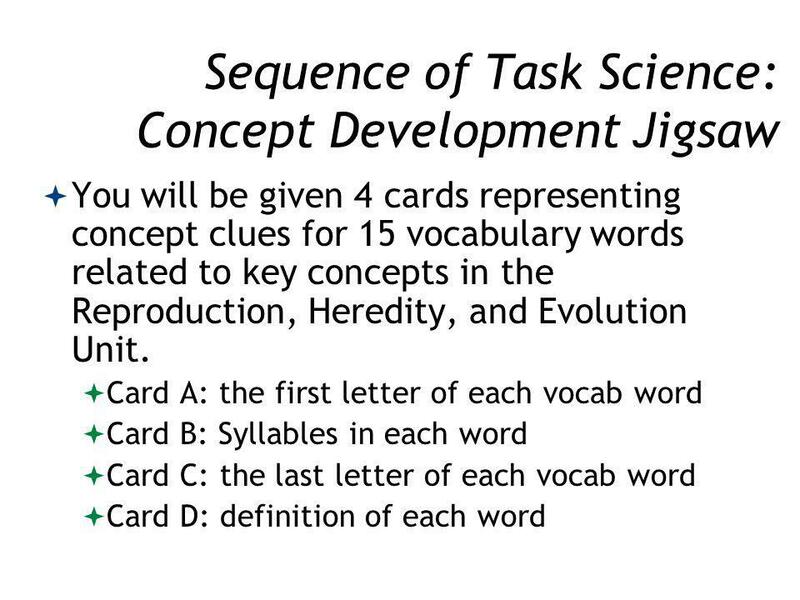 This time, try to use some science vocabulary to add to the description. 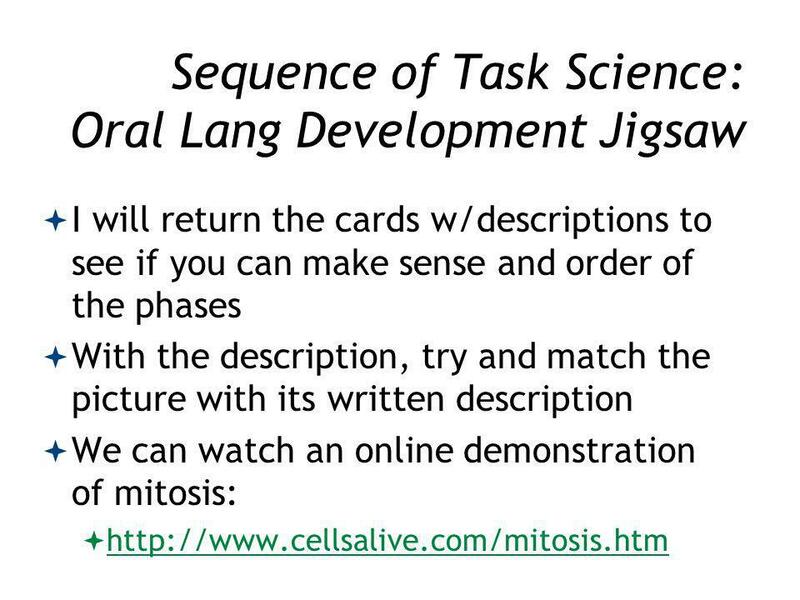 Amend your original description with the added science words and read to a neighbor. Now, we’ll watch with sound. Discuss with your neighbor. 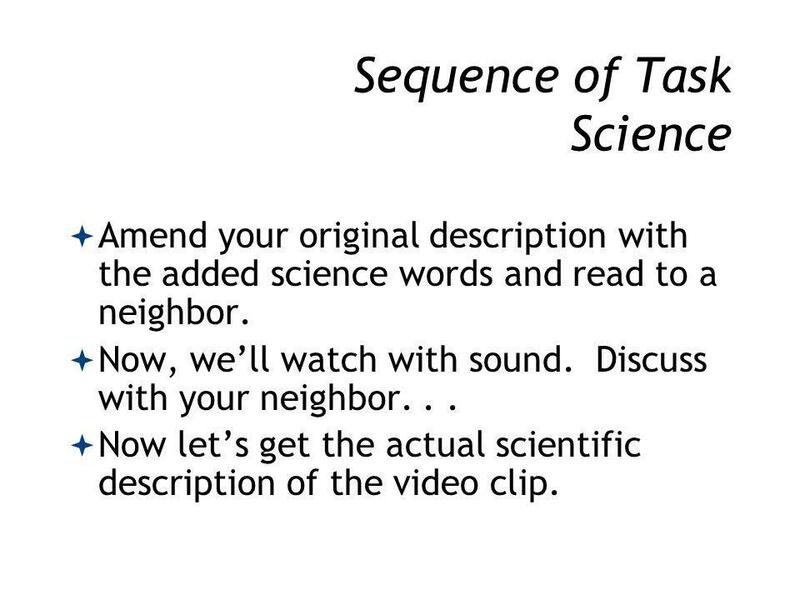 . . Now let’s get the actual scientific description of the video clip. 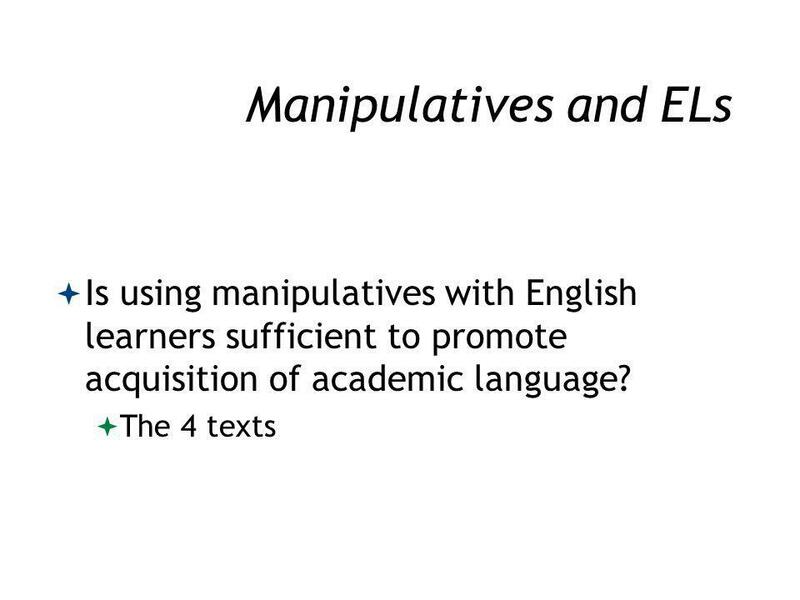 20 Manipulatives and ELs So, the message is that using manipulatives is not enough for English learners or many others to really learn and gain academic language. 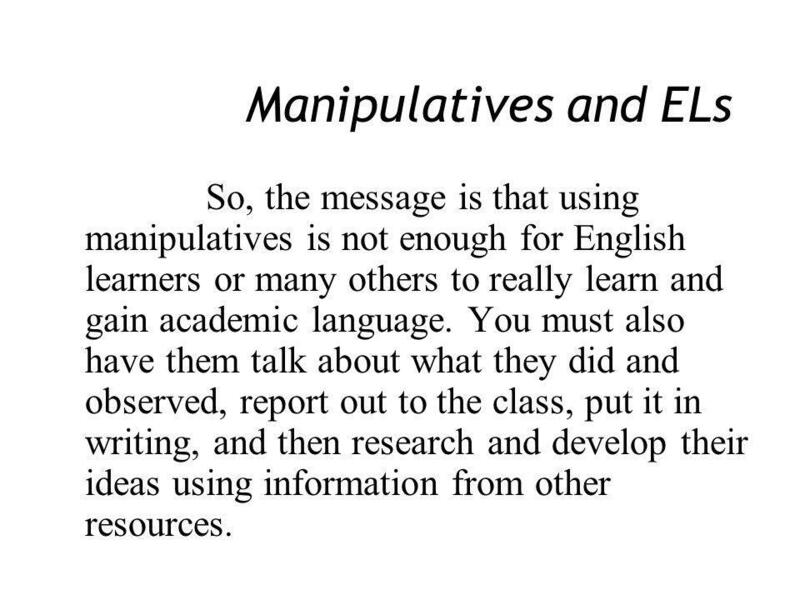 You must also have them talk about what they did and observed, report out to the class, put it in writing, and then research and develop their ideas using information from other resources. 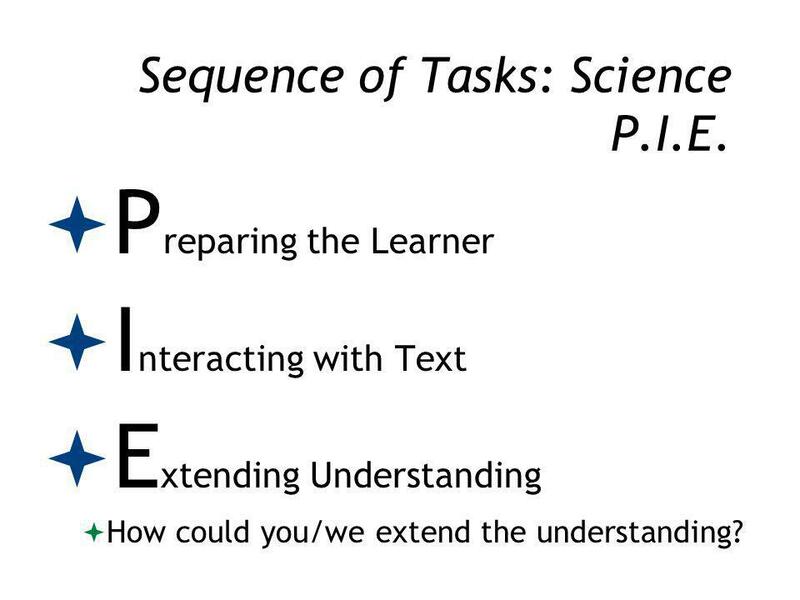 21 Sequence of Tasks: Science P.I.E. 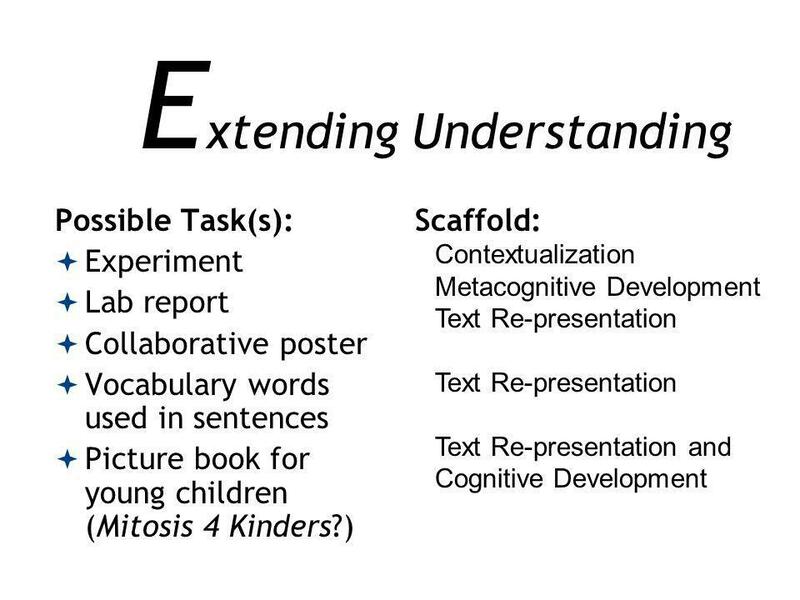 Preparing the Learner Interacting with Text Extending Understanding How could you/we extend the understanding? 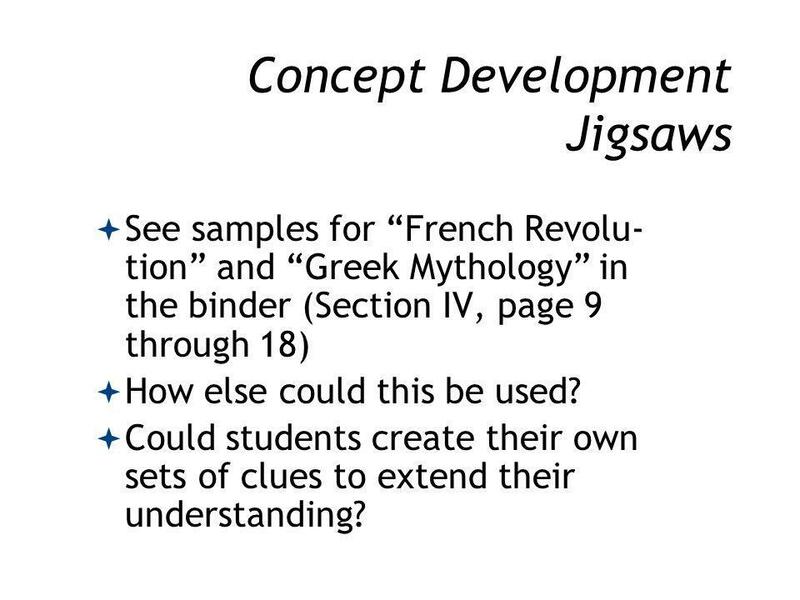 See samples for “French Revolu-tion” and “Greek Mythology” in the binder (Section IV, page 9 through 18) How else could this be used? 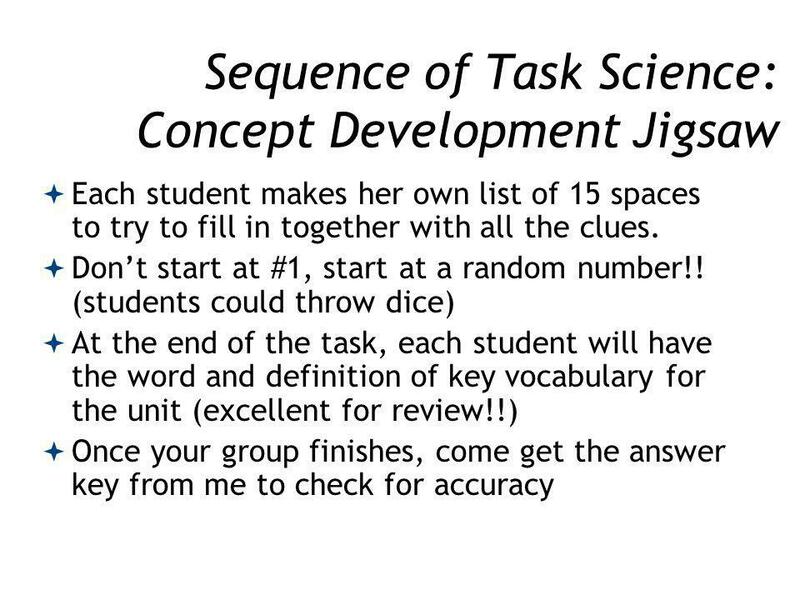 Could students create their own sets of clues to extend their understanding? 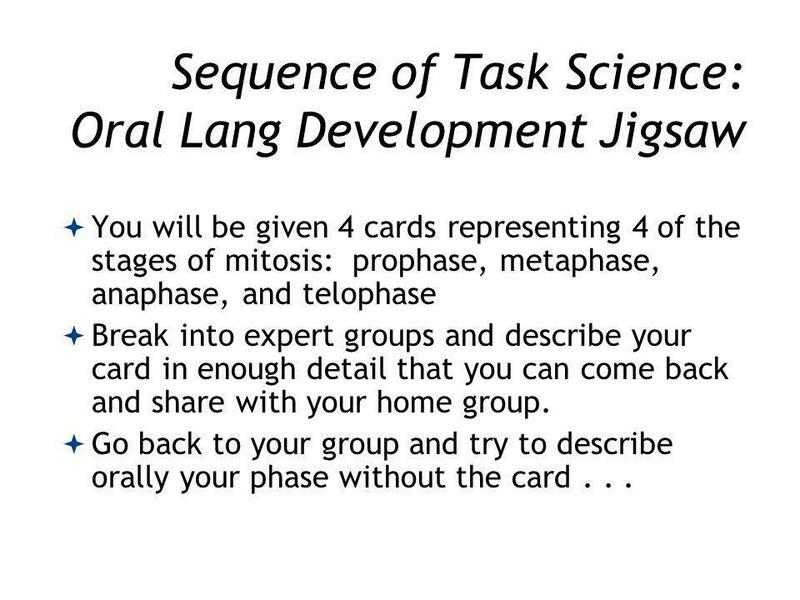 While this task involves interacting with the text, it stands alone because it is not within a sequence of tasks Task: There are 7 different cards. We’ll do a line up and number off 1 through 7. 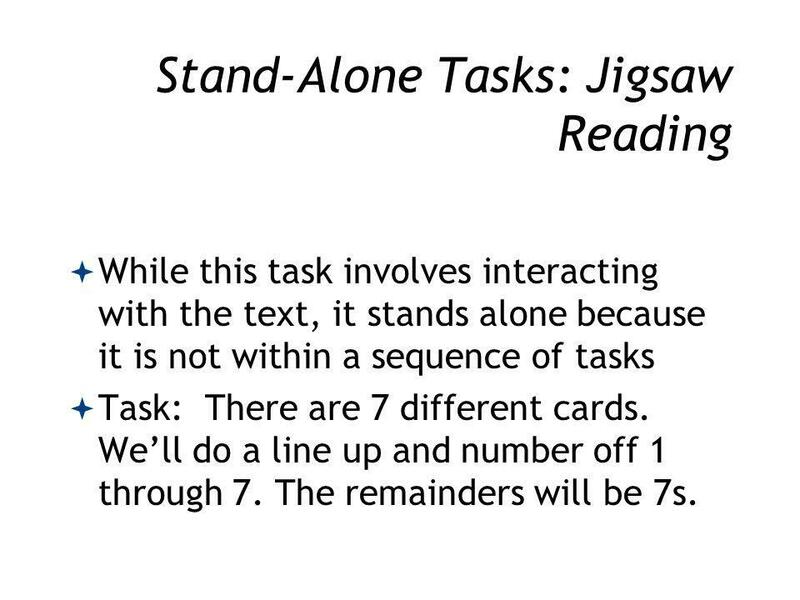 The remainders will be 7s. 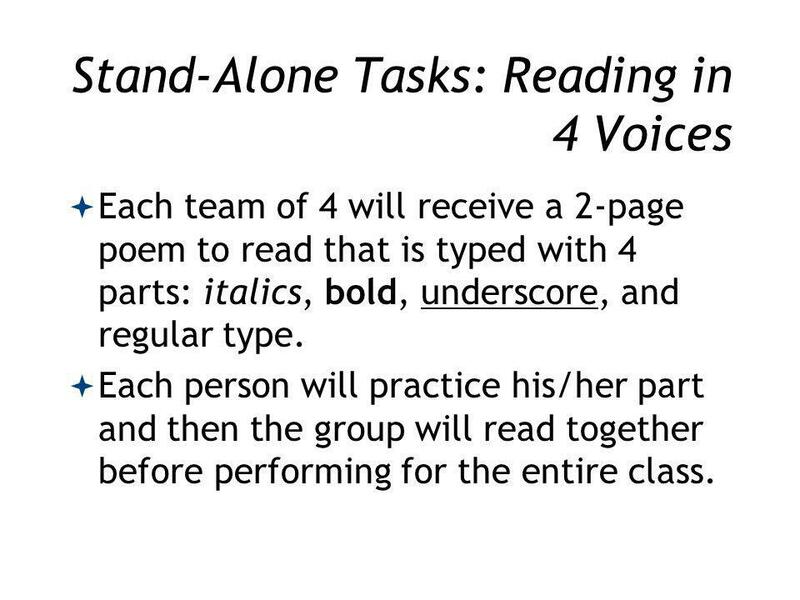 Each team of 4 will receive a 2-page poem to read that is typed with 4 parts: italics, bold, underscore, and regular type. 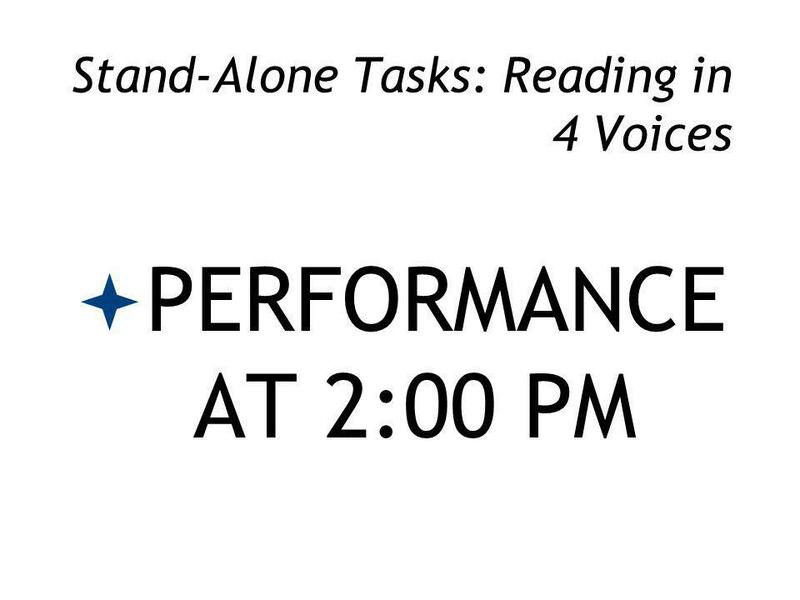 Each person will practice his/her part and then the group will read together before performing for the entire class. 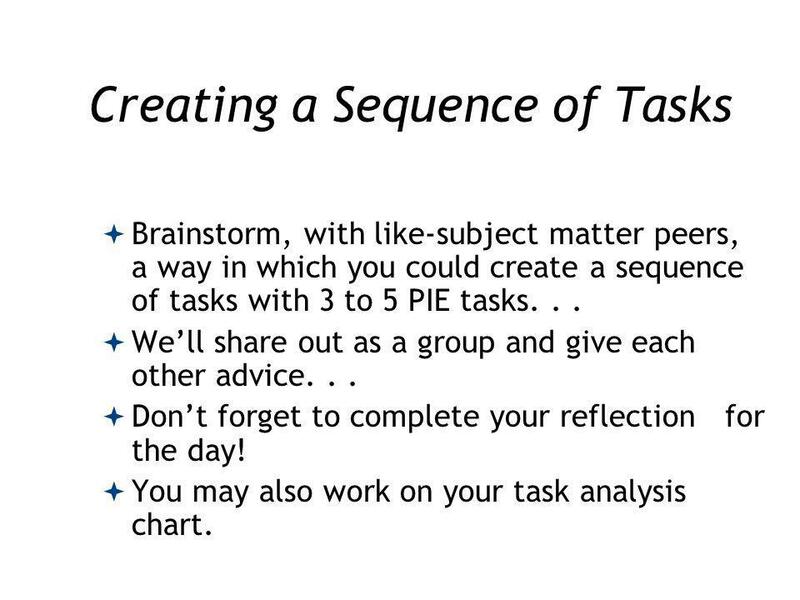 Brainstorm, with like-subject matter peers, a way in which you could create a sequence of tasks with 3 to 5 PIE tasks. . . We’ll share out as a group and give each other advice. . . Don’t forget to complete your reflection for the day! 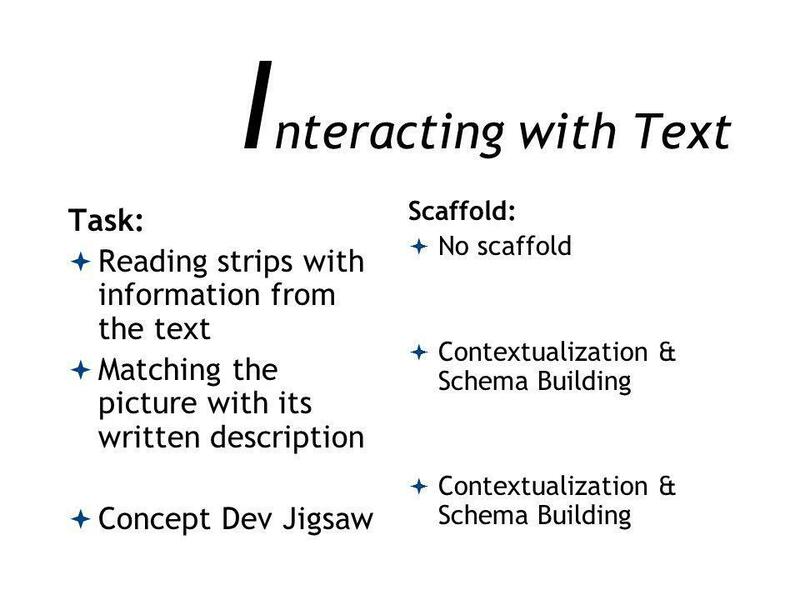 You may also work on your task analysis chart. 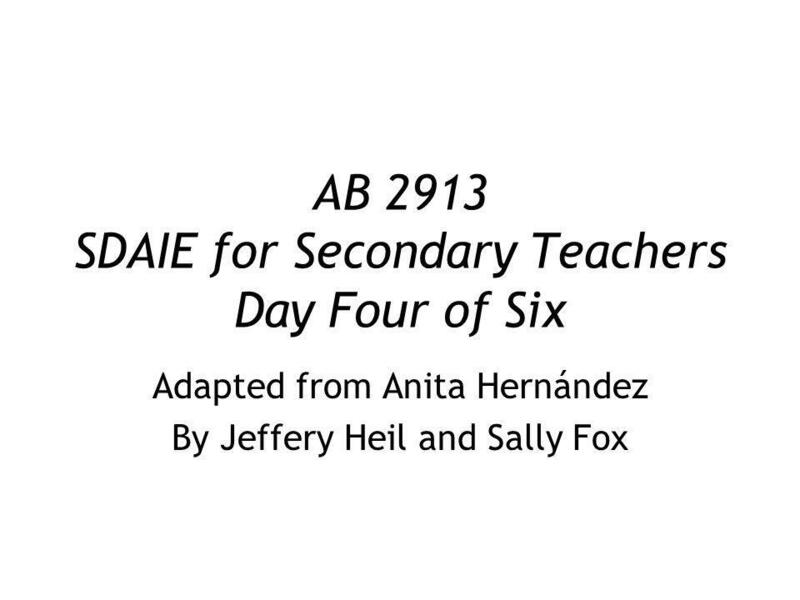 Download ppt "AB 2913 SDAIE for Secondary Teachers Day Four of Six"
AB SDAIE for Secondary Teachers Day Two of Six Adapted from Anita Hernández By Sally Fox & Jeffery Heil. 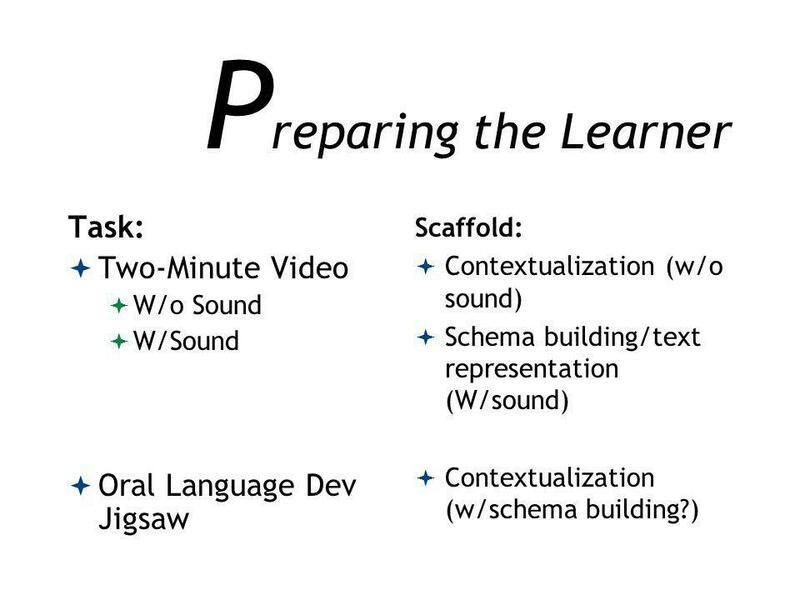 The SIOP ® Model INTERACTION. 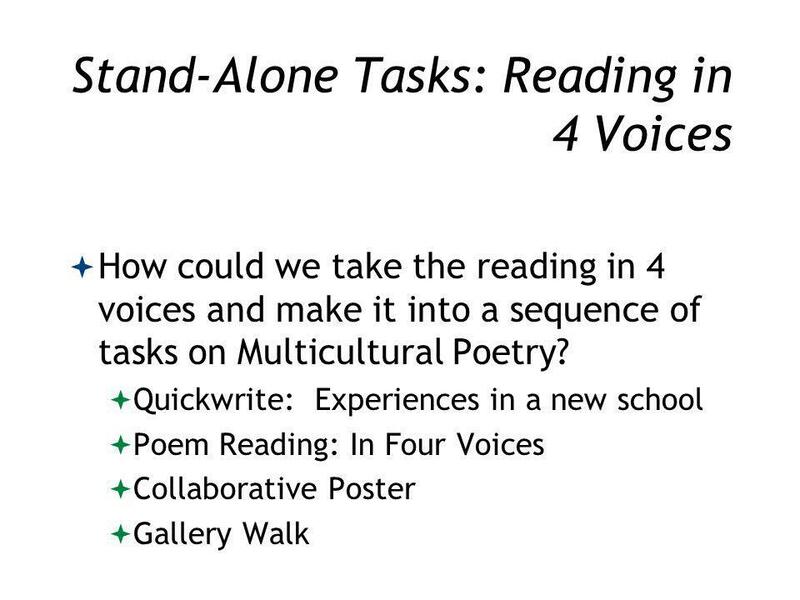 Content Objectives We will Select from a variety of activities that promote interaction to incorporate into lesson plans. Preparing You and Your Child for E.O.G. Testing FAQ About E.O.G. Testing Q: Why do the children have to take the E.O.G test? A: The North Carolina End-of-Grade. 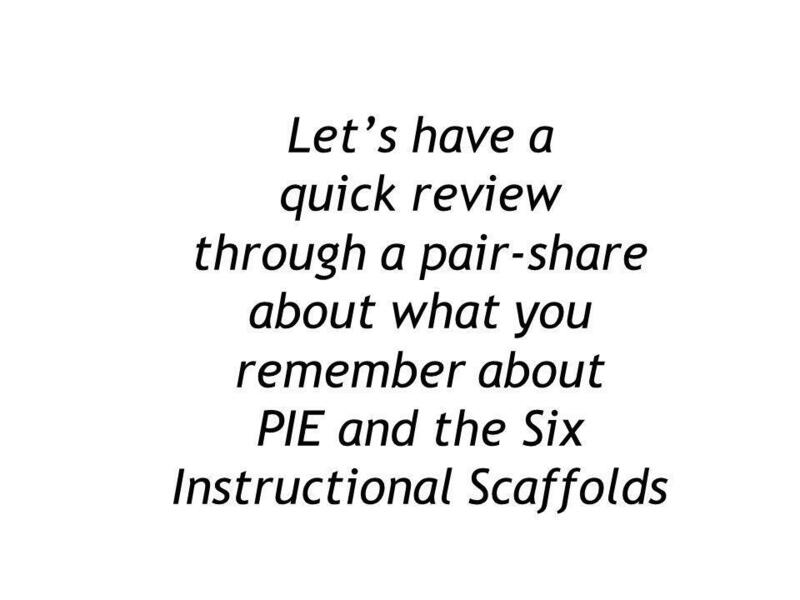 Instructions This is a framework presentation for you to manipulate – it has all the key ideas, but no personality! Please add: Design Visuals Activities. A Collaboration between: Los Angeles Unified School District University of California, San Diego San Diego State University University of California, Irvine.